Knox has been deployed in industries such as government, finance, and healthcare. Our best mobile security solution has been designed to meet the stringent needs of leading governments and regulated industries. Knox Platform for Enterprise (KPE) is a military-grade mobile solution for IT admins to manage and secure Samsung Android phones, tablets and Tizen watches for business. KPE provides a set of advanced and unique mobile device security management features to the underlying Android OS, for business customers and partners who require higher security standards. 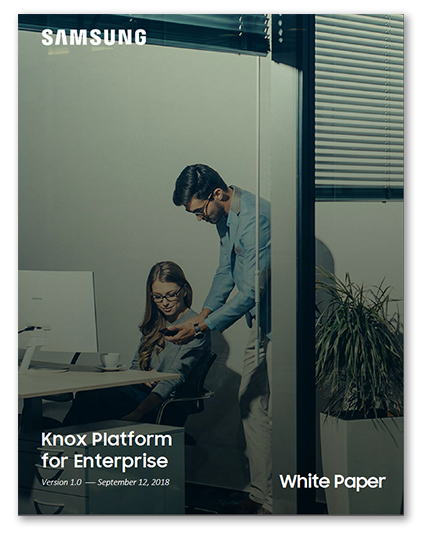 Explore Knox Platform for Enterprise features below, or download the white paper for more details. Knox Platform for Enterprise leads the mobile security industry with more global government security certifications than any other solution. These include Common Criteria and FIPS 140-2, as well as government certifications from US Department of Defense, UK NCSC, and France ANSSI. Samsung continually works with international regulatory bodies to meet a wide range of certification requirements designed to protect national interests, public safety, and consumer privacy. The Knox Platform for Enterprise solution provides a robust set of features on top of the core Android Enterprise platform, to fill security and management gaps and meet the strict requirements of highly regulated industries. The additional features in KPE have been designed to address more sophisticated security needs for confidential data, providing powerful features for Android for stringent requirements in highly regulated industries. The following table summarizes unique advantages offered by KPE in addition to Android Enterprise. Comprehensive device management Wide range of device configurations fully supported partially supported with diffentiation partially supported Advanced authentication options, booting splash customization, etc. Advanced authentication options, booting splash customization, etc. KPE security begins in the factory with a hardware-backed trusted environment, upon which a chain of stringent security checks are performed on software components leading up to device boot and during run time. Using Knox Verified Boot, KPE also checks for unauthorized or outdated bootloaders to ensure your device only starts up using valid bootloaders. During device operation, Real-time Kernel Protection (RKP) protects your OS from kernel attacks by monitoring and preventing unauthorized modifications and attacks. Irretrievable device-unique hardware keys and one-time programmable fuses, only accessible via the TrustZone. Prevent unauthorized Kernel access or code modification in run-time. Block authorized system partition modification. Knox Platform for Enterprise uniquely protects data at rest by encrypting it not only when a device is powered off, but also when it is powered on but locked. It also provides further protection by allowing enterprise data to be isolated in secure app/ data containers, such as Knox Workspace, which can be managed with security policies separately from the rest of the device. To secure data in transit, KPE offers several differentiated and even more secure VPN options, such as per-app/container and device-wide VPN, on-demand VPN, VPN on-premise bypass, HTTP proxy over VPN, and VPN chaining. On-demand VPN for optimal connection based on target application usage. HTTP Proxy over VPN to allow web proxy settings to function while traffic is flowing over a VPN tunnel. Knox Platform for Enterprise gives IT admins granular device management at the system level to solve common frustrations when mass deploying devices. Deploy hundreds of differentiated security policies that change and manage device settings, such as email, authentication, connectivity, container, and customization settings. KPE also gives users granular and enforced Mobile Application Management (MAM) capabilities without Managed Google Play. Set system-level feature restrictions, including Common Criteria mode, and policies to phone mirror with Samsung DeX. Knox Platform for Enterprise provides powerful tools to monitor end-user activities, including data traffic usage, to ensure all device usage is under IT’s control. Network analysis tools allow admins to view network patterns in real-time to detect potential threats or misconfigurations. Remote phone access for IT admins to capture/stream device displays and inject keyboard and motion events. Universal Credential Management (UCM) provides a plug-and-play framework for credential management across a variety of storage media. Find out more about how Knox Platform for Enterprise differentiates from Android Enterprise. Allows changing Active Directory passwords on the device instead of a PC. Controls which apps are allowed to use mobile data when the user is connected to a roaming network. Support added to limit access to the digital credentials in the TIMA Keystore to a single app. Lock or wipe the container in case the device is lost or stolen. Configurations for browser, Email, password, WiFi, VPN, firewall, etc. Customize the power ON/OFF for the devices with the Custom APIs. Permissions monitoring is now available for apps inside the container. New APIs for IT to block the data leakage. Check whether the device is in DeX mode. Block DeX mode. Enforce Ethernet data connection. Prevent certain apps from running in DeX. Add or remove app shortcuts. Change the loading screen. Control screen timeout settings. Configure align type of DeX launcher screen. Add a browser shortcut with a specific URL on DeX home screen. IT admins can capture Rich Communication Services (RCS) messages. Control Wi-Fi and Bluetooth background services. Enterprises can allow power saving mode to extend battery life, or disallow power saving mode to optimize manageability. Set a Home screen mode to Home screen only or Home screen and applications. Previously supported only in ProKiosk mode, but is now also available at the device level. Control the application shortcuts that are displayed in the bottom row of the Home screen. Remove a page from the launcher including all shortcuts and contents. Samsung and Google have partnered to deploy a common architecture for secure containers starting with S8 devices running Oreo. Support compliance with GDPR (General Data Protection Regulation). The contents of Knox PP (Privacy Policies) has changed for handling user data. Support added for Elliptic Curve Cryptography (ECC), including storage for such keys in the protected TIMA CCM keystore. Enhances network security between an Enrollment over Secure Transport (EST) client and EST server per RFC 7030. Samsung's Universal Credential Management (UCM) embedded Secure Element (eSE) plugin allows apps to access eSE of Samsung mobile devices. Start a free full-feature trial of Knox Platform for Enterprise. Purchase a monthly or yearly license from your local Knox reseller. Our Knox sales team is ready to collaborate with you to address your biggest business challenges. Please provide your contact details to get started with a free trial or discuss a project with our sales team. Already a Knox user? Log in to your Samsung Knox account to submit a support technical ticket.